My first post here, I've lurked but never joined. Back in the mid 80s i had a 77 Macho RC and have had a 79 and an 81 Trailduster as well but have been RC/TD free for 12 ears and looking to change that. I'm going to look at this thing to tomorrow. I have. Ever even seen a picture of a 79. It sure is rusty not sure if it is saveable supposedly has the roll bar and a factory CB. It used to have a plow and the brush guard and lights are missing. Looks to have the original paint not that it matters with all the rust. Honestly I've promised myself no more rusty projects but I feel this thing should be saved. Anything I should look for in particular? Especially with the Top Hand package. Did not make it out there yesterday. What do you guys thinkl its worth? I've never seen a pic of a 79 any guesses on how many were made? My big problem is I've been looking for a rust free pop top to paly with and build in a pre-runner style and this is 180 degrees opposite of that. It's worth the $1K running. The rust on the back fenders can be a lot of work.........but don't give up yor first idea of a pre runner. These trucks with the Top Hand option are only worth what some one is wanting to pay for it in restored condition. Drive it the way you want and enjoy it. Just tell the story about the truck option (Chuck Conners : viewtopic.php?f=48&t=1142 ). My first thought when you asked what to look for???? could be a 3$ fuel filter to get it running (20$ pump)? Truck was sold, I missed it, I was near him in the morning but couln't connect, and had other irons on the fire last night and this morning. Oh Well, I just hope it went to a good home. 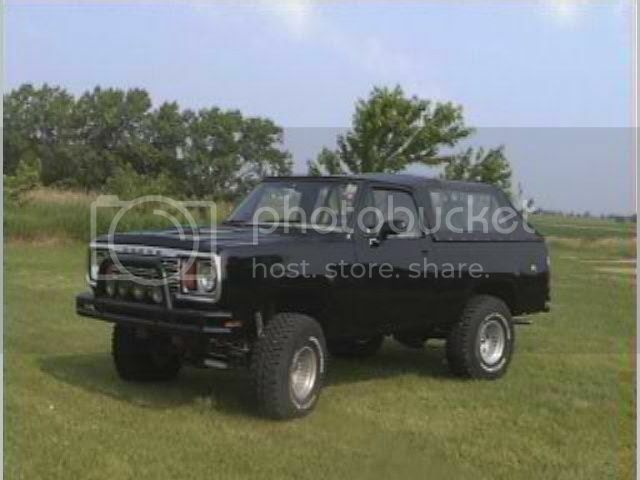 Its probably for the best, I have already restored a 79 Ramcharger with all new sheet metal(back when it was still available from Mopar) and don't really want to do it again.